Here's our experience regarding the various field guides you may (or may not) wish to pack for your Bonaire trip. YOU WILL PROBABLY NOT BE SURPRISED TO LEARN THAT WE THINK THAT THE MOST ESSENTIAL BOOK FOR YOU TO BRING ON YOUR NEXT BONAIRE TRIP IS OUR NEW BOOK, "BIRDS OF ARUBA, BONAIRE, AND CURACAO: A SITE AND FIELD GUIDE." 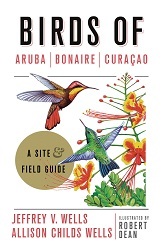 Birds of Aruba, Bonaire, and Curacao: A Site and Field Guide. 2017. Wells, J.V., and A.C. Wells. Cornell University Press, Ithaca, NY. 474 pp. "This book is a superb field guide, a site guide with colorful maps, and a well-illustrated introduction to the ecology and conservation of Aruba, Bonaire, and Curacao, all in one package. It raises the bar significantly for birding books." Birds of the Netherlands Antilles. 1983. K. H. Voous, de Walburg Pers, Utrecht. 327 pp. This wonderful book, now out of print for 20 years, is packed full of interesting information about the status and life history of the birds of not only Aruba, Bonaire, and Curaçao but also of Saba, St. Eustatius, and St. Martin. This is the only book that covers the identification and status of all of the birds of Aruba, Bonaire, and Curaçao (as of 1983). The book is delightfully rich, even meticulously detailed in some areas, and the information is delivered with precision in a decidedly European style, making it an enjoyable read in and of itself. The book is a little weak in some of the species descriptions, including their vocalizations, and the plates are not up to today’s field guide standards. Thus, some may find the book a bit difficult to use for field identification. We have a great fondness for this book, which, incidentally is of exceptional physical quality, having withstood our many years of visiting the islands. This great resource can be found through used booksellers both conventional and online. Birds of Venezuela. 2003. S.L. Hilty, Princeton University Press, Princeton, NJ. 878 pp. This amazing book raises the bar for South and Central American field guides. The plates combine those from the previous addition with new ones, and most are excellent (those by Guy Tudor are particularly stunning). But the text and range maps are what make this book especially incredible. Although its bulk makes it unwieldy as a field guide, this book is the best publication available concerning those species found on Aruba, Bonaire, and Curaçao that regularly occur in Venezuela. It is also indispensable for birders wanting to prepare themselves for finding species from the mainland that may occur less regularly on the islands. Keep in mind, though, that not all species that occur on the ABCs are depicted or included in this book, so don’t expect it to cover all of your needs on the ABCs. A Guide to the Birds of the West Indies. 1998. H. Raffaele, J. Wiley, O. Garrido, A. Keith, and J. Raffaele. Princeton University Press, Princeton, NJ. 511 pp. An excellent book that surpasses the classic Birds of the West Indies by James Bond, perhaps most importantly because of its up-to-date taxonomy and because of the status and larger number of species depicted. This is the best guide available to have with you when visiting any of the Greater or Lesser Antilles within the Caribbean, and many of the species that occur on the ABC’s are included. However, there are a number of species from the ABCs that are not included in the book. Some of the books plates are a little weak, and many of the species accounts lack the necessary identification detail, which can be a bit frustrating. A Guide to the Birds of Colombia. 1986. S.L. Hilty and W.L. Brown. Princeton University Press, Princeton, NJ. 836 pp. A great book, but not essential when birding on the ABCs, having been superceded by the 2003 edition of Birds of Venezuela. A nice reference, but we don’t pack it in our bags for the long haul down to the islands, especially if Birds of Venezuela is already packed. Field Guide to the Birds of North America, Third Edition. 1999. National Geographic Society, Washington, D.C. 480 pp. A North American field guide is a must for birding on Aruba, Bonaire, and Curaçao, as many of the species you will see are wintering or migrant North American breeding birds. These include shorebirds, terns, and warblers, most of which are not depicted well or at all in the field guides covering the Caribbean or South America. The National Geographic Guide was long the gold-standard for modern field guides for North American birds. Although in recent years it has, in some ways, been eclipsed by the Sibley Guide to Birds, it still has better and more text than the Sibley guide, and its smaller size fits better into the suitcase. The Sibley Guide to Birds. 2000. D. Sibley. Chanticleer Press, New York, NY. 545 pp. As we mentioned, you must take along a North American field guide when you visit the ABCs. This one is currently considered by many to be one of the finest available. The illustrations are exquisite and wonderfully accurate, and much up-to-date identification information is included. For those who prefer the text to do the explaining, the sparseness of explanatory material may be a bit frustrating. It is a bit like having a series of beautifully prepared museum specimens laid out before but you have to do some of the work yourself. Although we love the book, less experienced birders may find it tougher to use. Sibley has also produced separate guides to eastern and western North America that may alleviate some of the problems with lack of explanatory text. However, since anything is possible when it comes to birds showing up where they aren’t necessarily supposed to, we recommend that you bring along a guide to all of the birds of North America when visiting the ABCs. Our Birds. 1993. B.A. De Boer. Stichting Dierenbescherming, Curacao, Netherlands Antilles. 120 pp. This small book is written for a local audience, making it an extremely important outreach and education tool for conservation. It covers the common birds of Aruba, Bonaire, and Curaçao. It is illustrated with photos of birds from the islands, and each short species account is provided in three languages (Papiemento, Dutch, and English). Hard to get a hold of outside of the ABCs but, fortunately, many local bookstores and resort gift shops seem to carry it. "STERN" - Guide to the Birds of Aruba. 1999. J.H. Reuter. STERN nv., Aruba. 136 pp. Another small locally produced book that covers primarily the common birds of Aruba with photographs. A checklist in the back of the book gives the status of all bird species mentioned in Voous as well as a few additional species recorded since 1983. Like the previously mentioned book it is probably only available on the island.